The idea of cooking ‘en papilotte’ (‘in parchment’) is quick and simple and keeps all the flavours locked in. Here delicate salmon is balanced with the aromatic flavours of Asia to bring a simple yet tasty meal. Monkfish or cod loin would also be perfect for this recipe if you prefer. I am a big fan of all Asian greens so I have used pak choi to layer the salmon on top of so it steams altogether. 1. Start by preheating the oven to 190c/ 170fan. Take all the ingredients apart from the salmon and spring onions and combine in a small bowl; mix well and set aside. 2. Grab a couple of lengths of foil which will be big enough for the fish to sit happily in and lay them out on the work surface. Lightly oil each piece. Divide the pak choi and spring onions slices between the two pieces of foil and place them in the centre. Place the salmon atop its leafy, oniony bed and pour the dressing over the fish. Add a splash of water into each parcel so it steams well before gathering the foil together to create a well sealed parcel. 3. Place on a baking tray and cook for around 12 minutes until the fish is tender. Remove carefully and serve with a side dish of jasmine rice. Salmon parcels- the key to delightfully fragrant and straightforward midweek meal! 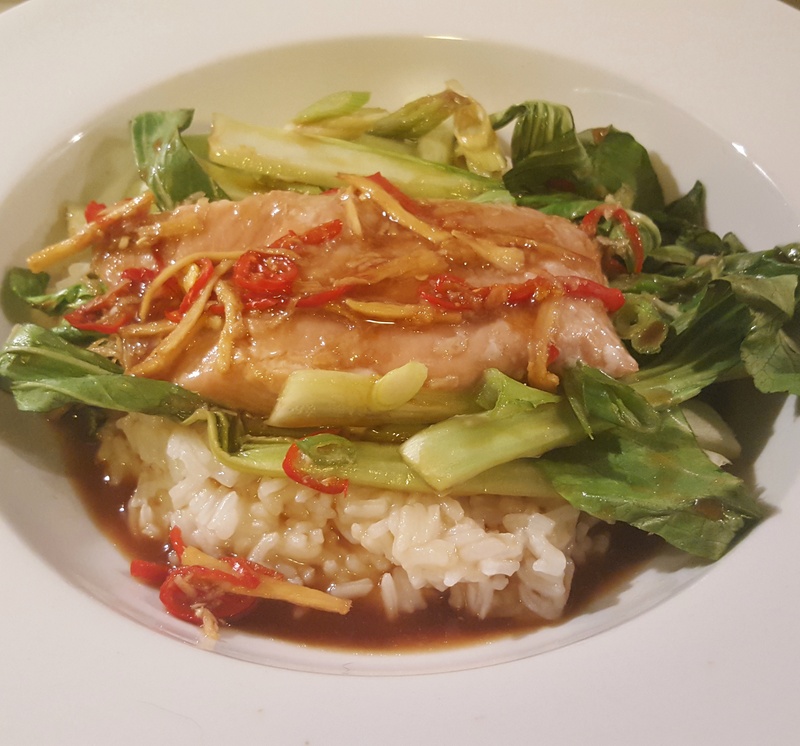 This entry was posted in Recipes and tagged chilli, cod loin, garlic, ginger, jasmine rice, monkfish, salmon, soy sauce, spring onions by sotiris14. Bookmark the permalink.